"CONTRAST" is a fitting name, as this vessel is a stark contrast to anything you've seen before! 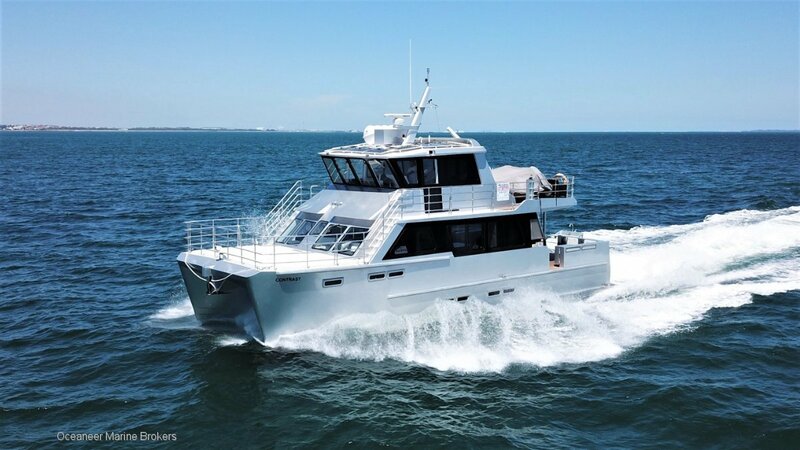 Meticulously constructed by Gold Coast Ships in Thailand, this purpose-built aluminium expedition catamaran will be the ultimate platform to cruise long range around the Australian coast and further to Southeast Asia or New Zealand. Sleeping accommodation for 12, configured as two master suites with queens and ensuites, plus two guest cabins with 4 singles in each. A day head with shower services the guest cabins and the rest of the saloon. An impressive 2.8m long island bench looks fitting in the aft-positioned galley, great for serving casual meals or entertaining guests around if you are a bit of a chef and don't like to be hidden from the party. A large settee with seating for 8 can be used to serve meals it should the weather be too inclement for cockpit dining. The aft cockpit is certainly the most impressive feature considering this vessel is only 16m long. Full stainless BBQ, ice maker and ice box give keep the entertainment going and the open-plan style of the cockpit floor give the feel of a much larger vessel. Dual helm stations complemented with a full Raymarine electronics fitout will ensure long distance navigation is easy and safe for any competent skipper. Dual Yanmar CXBM 470HP diesels on ZF gearboxes prove reliable, efficient and quiet when under way and propel the ship to a top speed of 23 knots. Incredibly economical cruising speed of 15 knots accompanied with 5,600L fuel capacity will ensure your refuelling stops are few and far between. Twin Onan gensets ensure complete confidence in the vessels house power supply, plus two water makers for those demanding trips offshore and up north. On the flybridge deck, a 650kg Davco davit lifts the sizable tender to the water with ease. The entertaining space when the tender has been moved is incredible, and adds another space to be utilised when the vessel is loaded with guests. She was built to NSCV AMSA 1B and 1D standard with 22 and 36 passenger numbers respectively. Minor additions and labelling are required before the inspection but would not be difficult and relatively inexpensive to obtain a current certificate. Please contact one of our experienced brokers if you wish to obtain a full vessel specification sheet and high quality images. Inspections can be booked with Brad, Matt or Tom at any time, please email sales@oceaneermarine. Com. Au or call +61 (08) 9243 6373.
accomodation2 x Queen beds with ensuites, 2 x guest cabins with 4 single bunks in each.